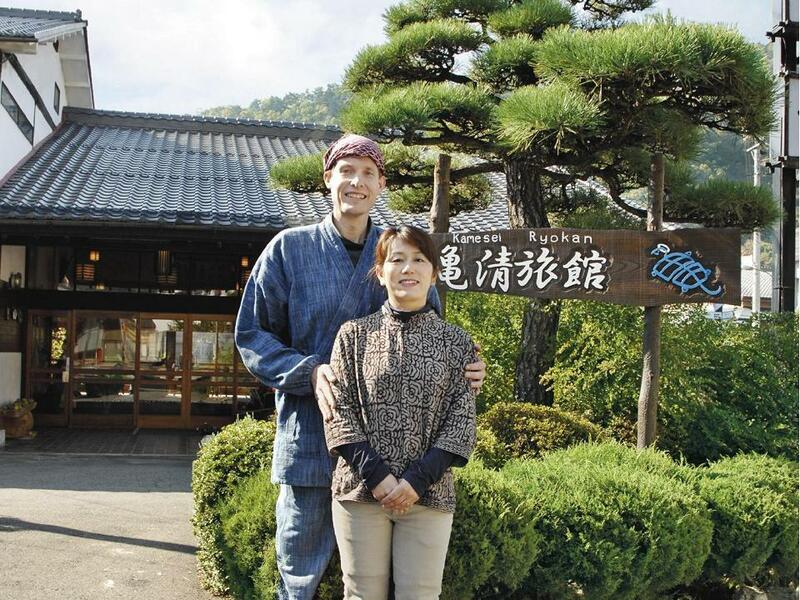 Friendly, Traditional Japanese Onsen Inn run by an American-Japanese couple. 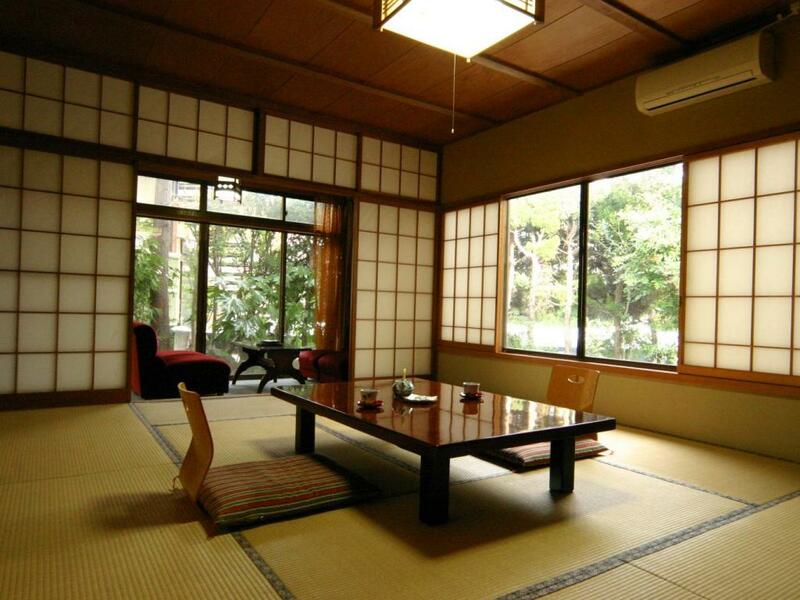 Small 12-room traditional ryokan with onsen hot spring baths in an onsen town along the Chikuma River. Mostly wood construction with the oldest building dating from over 100 years ago. Family-run but with a professional full-time chef. Proprietor is from America and is happy to share his enthusiasm for his adopted hometown with guests. Experience the heart and soul of Japan -- make Kamesei Ryokan your base for exploring Nagano. Our traditional Japanese inn features a soothing onsen hot spring bath. Feel the warmth of our wood construction while enjoying the inn's gardens and koi pond. Relax in the spacious 10 tatami mat guest rooms while lounging in a light yukata robe. 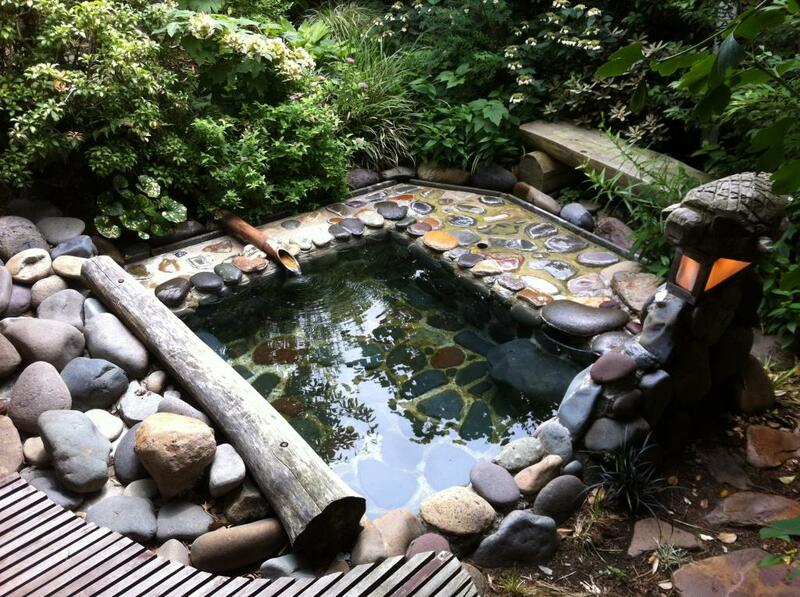 Both main onsen baths have outdoor baths as well, hand-built by our proprietor. One is wood, made from yellow cedar. The other is a garden bath made of river stones, and is open to the sky allowing you to bathe in the starlight as you soak in the onsen water. Local travel info happily provided by our proprietor. Tyler is an American who would be glad to share insight into his adopted home here in the Japanese countryside. In fact, he started Zukudashi Eco Tours, a program to provide cycling and walking tours of the onsen town and vicinity. Full dinner and breakfast are available and are highly recommended in order to truly appreciate the ryokan experience. Gourmet Kaseki-style Dinner featuring local and seasonal ingredients +4,320 yen (pls advise in advance to allow for preparation); full Ryokan Breakfast +2,160 yen (pls request at check-in); or +5,400 yen for both. Our town of Togura-Kamiyamada Onsen is unique because it is an onsen town -- feel free to use our wooden geta sandals and walk around in your yukata. Browse the many local shops, soak your feet in the footbath, or wander down by the Chikuma River. Or walk up to the mountain castle on the hill behind our town, or rent a bicycle and ride along the Chikuma River. For dinners out, our guests enjoy the wide variety of restaurants. Especially popular are Kohaku which features the local specialty, a very, very spicy udon dish. NOTE: Standard rooms are equipped with toilets; bathing facilities are with the hot spring mineral baths. Vegetarian Meals provided upon Request. Knowledgeable help for your Nagano itinerary is gladly provided. In the lobby and all guestrooms. 2 guestrooms directly in front of the baths. The entrance, guestrooms and baths all have 1 step. The indoor baths have handrails. Itinerary planning assistance gladly provided. From Togura Station(Shinano Railway), 7 minutes by bus (#9, "Kamiyamada Onsen Koen"　上山田温泉公園 stop). Free shuttle service available 14:30-17:30 -- just call upon arrival. To walk (2.2km, approx. 30min. ), proceed straight (west) from Togura Station 400m on Route 336 to 戸倉上山田中学校前 signal (middle school on northwest corner). Turn left and go south 300m to City Office Togura Branch signal. Turn right onto Route 55 and go west 600m crossing the Chikuma River to Sarashina Shrine light. Turn left onto Route 77 and continue south 1km as road curves and becomes Kamiyamada Onsen's Chuo-dori (main street). Turn right onto Koen-dori (in between the clothing shop and pharmacy, before the gas station) and Kamesei will be directly ahead. From Sakaki IC, Proceed straight 2.5km down Route 91 to Sakaki Inter signal and turn right onto Route 18. Go north 6.7km to Togurakamiyamadaonsen signal and turn left onto Route 498. Proceed west 1km crossing the Chikuma River to Kamiyamada Culture Hall signal. Turn right onto Chuo-Dori and head north 200m to Koen-Dori and turn left. Kamesei will be straight ahead. Daikokuya : Kamiyamada Onsen's Tiny Cafeteria Famous for Their Ramen and Garlic-Sauce Tonkatsu Pork.